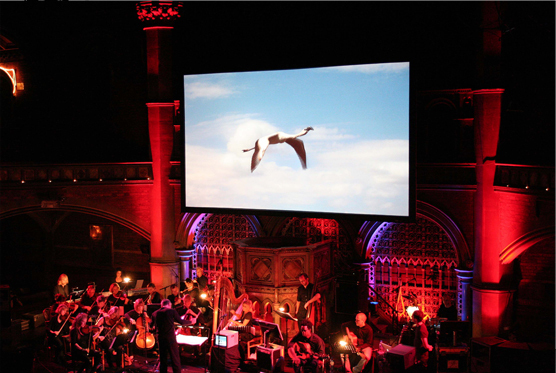 Leander’s experience of executive-producing The Cinematic Orchestra’s award-winning soundtrack album for The Crimson Wing, during which he worked closely with composer Jason Swinscoe and score producer Steve McLaughlin, makes him well placed to lead the direction of future soundtracks. Leander enjoys personal relationships with a diverse range of major recording artists and is closely connected to some of the leading music supervisors and sound designers in the business, offering clients a one-stop consultancy for their film project’s sound and music needs. Leander also worked closely with The Cinematic Orchestra on their highly acclaimed live performance of The Crimson Wing at London’s Union Chapel in September 2009, and subsequently on other Cinematic Orchestra shows, including the Roundhouse show that formed part of their In Motion tour in 2011.